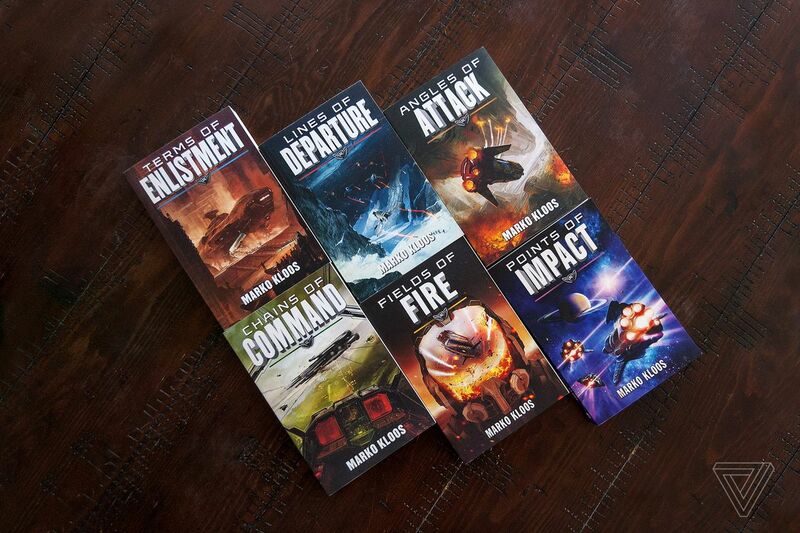 For the past couple of years, I’ve been hooked on Marko Kloos’ military science fiction Frontlines series. Set on an overpopulated Earth in 2108, it follows a soldier named Andrew Grayson who joins the military and ends up facing off against an overwhelming alien threat. It’s loaded with action, and in a publishing world where novelists are continually working to reinvent or subvert genre tropes, it’s refreshingly straight forward. The series authentically captures military culture, providing a glimpse into a lifestyle that the civilian world rarely sees through a sci-fi lens. 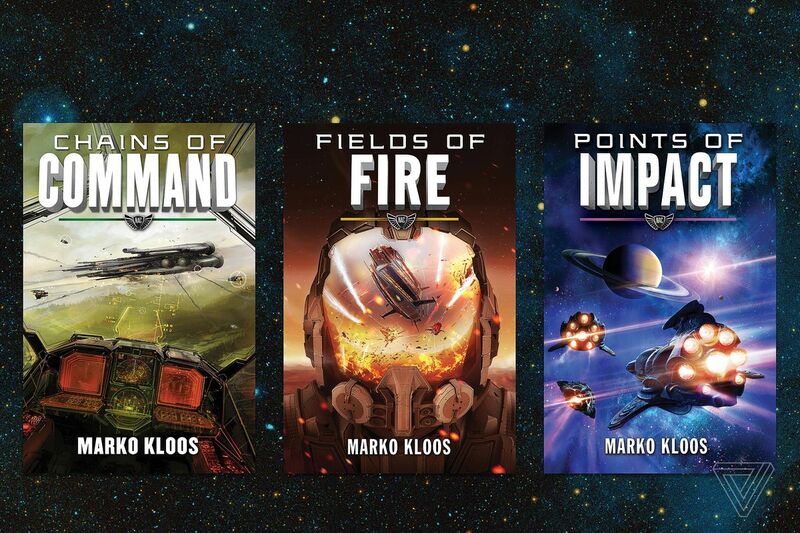 Kloos recently published the sixth installment of the series, Points of Impact, and it’s the perfect time to jump in and check it out. Spoilers for the series ahead. 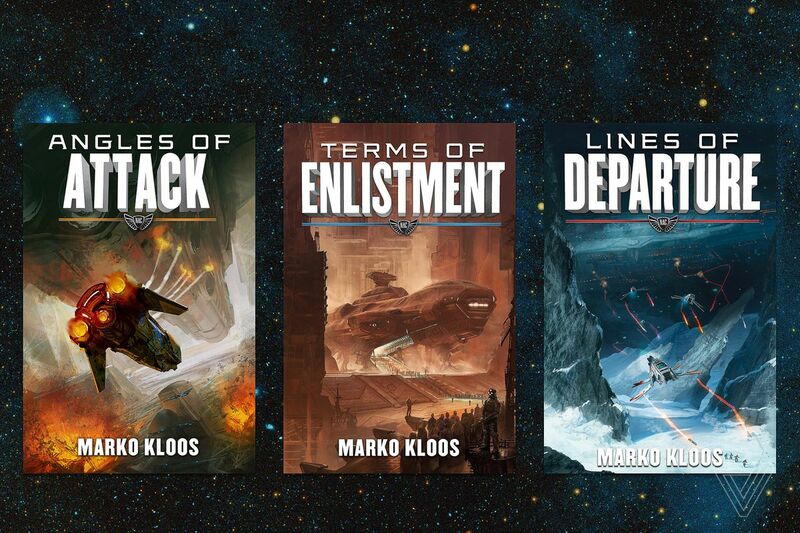 The series begins with Terms of Enlistment, which Kloos originally self-published in 2013. We’re introduced to Grayson, who grew up in a dangerous welfare tenement in future Boston, where he faces two choices if he wants to escape the slums: win a lottery for a chance to settle on a distant planet, or join the military. He opts for the latter, and Kloos details his training, the weapons and equipment, and his entry into the North American Commonwealth’s (NAC) Territorial Army in a methodical manner that recalls Robert Heinlein’s Starship Troopers and John Scalzi’s Old Man’s War. He’s tasked with maintaining law and order in the country’s hellish Public Residence Clusters, only to be drummed out of the service after a battle that goes sideways. But he’s given another chance in the country’s spacefaring Navy, where the NAC faces off against terrestrial foes, such as the Sino-Russian Alliance, which also maintains a network of off-world colonies. In space, he reunites and falls in love with a fellow trainee, Diana Halley, a drop ship pilot. Rather than just play out Cold War tensions in space, Kloos throws his characters a curve ball: aliens. Grayson, Halley, and their crew discover that an unknown species has appeared on a colonial planet, and they don’t have good intentions. Nicknamed Lankies, the 80-foot tall aliens are almost invincible on the battlefield, and before long, humanity is forced into retreat from its colonial holdings. The sequel, Lines of Departure, picks up five years later, as the NAC continue to fight against the Russians and struggle to maintain a foothold in the galaxy. Grayson goes from a systems engineer on a fleet ship to combat controller — a special forces soldier who drops into hostile territory and guides in the Navy’s drop ships and fighters. Greyson and Halley are reassigned to a distant frozen colonial world named New Svalbard, where they help fend off a major Lankie invasion. In Angles of Attack, they return, only to find that many in Earth’s government have fled to a safe world just as the Lankies invade our solar system, leaving the planet helpless. The invasion is thwarted nonetheless, and from there, Grayson and Halley are on the front lines of the war defending Earth’s Martian colonies from invasion and occupation. Kloos pits Grayson against not only hordes of nearly invincible enemies, but against his own fatigue after long years in the service. Military science fiction is perfect for long-running serial storytelling, but it can grow tedious and repetitive after a couple of installments of battle after battle. Kloos sticks to a familiar formula, but what makes these books stand out against the monotony is his balancing act of action and character development. They balance epic space battles and armored infantry battles on the ground against interludes of Grayson and Halley’s downtime and visits to their families. Each novel has its own focus: the defense of a planet, a major operation, or an attack, but the focus on their lives away from the battlefield is just as important. Grayson starts off as a grunt looking for decent food and a chance for a better life off-world, but ends up fighting in the defense of Earth. While there’s value in the idea of defending one’s species from extinction, or more abstract concepts like honor and bravery, his visits to a quaint small town nestled in the green mountains of Vermont show us the future he’s fighting for. Grayson and Halley go off to serve in the depths of space, knowing full well that they might never see one another again, but when they’re in the thick of the fight, they have something that motivates them beyond simply not dying: each other. Reading Kloos’ books over the last couple of years has been an interesting exercise in watching a group of characters and the organizations they fight for adapt to a changing world. At the beginning of the series, the human race is fragmented along political and national boundaries: there’s the North American Commonwealth and the the Sino-Russian Alliance fighting for living space across the Galaxy, as well as factions from Europe and Africa. But when humanity is faced with an existential threat, those various governments start to put aside their arguments and work together. Grayson goes from fighting against Russian and Chinese soldiers to fighting alongside them, discovering that the political differences of their home countries don’t hold up on the battlefield against a common foe. Just as the pivot from fighting human enemies to alien ones is also not an overnight process, we also see Grayson, Halley, and their comrades learn to adapt and survive through new tactics, new weapons, or even a bit of luck on the battlefield. It’s a transition that mirrors the changes in gear, tactics, and attitude that the US and allies have gone through during nearly two decades fighting in the Middle East. Kloos’ characters not only come to terms with new technologies that help them carry out their mission, but also how to fight alongside one another in order to return home at the end of the day. Military science fiction is a strange genre. The entire subgenre owes a major debt to Heinlein’s Starship Troopers, and its focus on nationalism and sensational war-fighting technology means that it and its successors often feel as though it’s aimed only at one audience: the military. I don’t believe that military service is a prerequisite for writing a military science fiction story, but the culture is something that’s hard to replicate, and veterans and those closely familiar to the military world can easily pick out when something is off. Accuracy is important here, but not just because it helps the reader immerse themselves in the story. In the real world, the divide between the civilian and military worlds is incredibly wide, with repercussions for both. The military world can be a confusing, perplexing world for civilians to understand, and many in the military feel that this alienation has serious consequences: military recruiting is down, leaving units and ships dangerously short-staffed, while service members returning home from overseas have a difficult time relating with and integrating into the civilian world. While science fiction itself often frames the world of science for readers outside of the scientific community, military science fiction can do the same for military culture, by providing insight into a very different world through an artistic lens. These books also help validate the experiences of veterans, signaling that someone out there is listening and working to translate this world for a wider audience. The sixth and latest installment of the series, Points of Impact, appears to be the last for the short-term future. Kloos says he’s taking a break to launch a different series, but that he’s not done with Frontlines just yet. That’s fortunate, because Points of Impact doesn’t end on a definitive note, and there’s still a lot of material for the series to work with. It hasn’t explored the Lankies in depth beyond their appearances on the battlefield, and as the conflict continues, I’d like to see the characters continue to cope with the trauma and pressure that the war puts on them. Although the series relies on a clear formula, it’s almost refreshing to read a series that doesn’t purport to dissect, invert, or upend conventional genre tropes, at a time when subversiveness has become the standard. Frontlines is earnest, optimistic, and fun, even as it deals with subject matter that’s intrinsically grim. It’s a story that strikes the perfect balance between escapism and serious reflection, and it’s the perfect military sci-fi series to escape into for a week or two.